Earn up to 495 reward points. 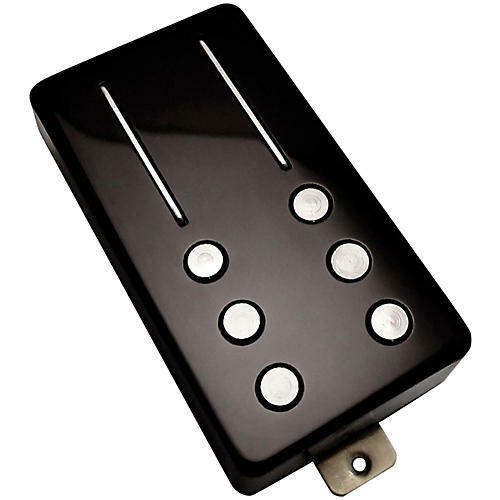 A new pickup design that generates improved tone no matter what your style. The Railhammer Anvil Pickup takes the Chisel platform and cranks up the windings another 15%. Now you have all the low end, thick mids, and smooth treble you expect from a high output beast. But this beast knows when to behave, offering up clarity and responsiveness unheard of in a pickup this hot. The perfect choice for amp-pummeling power and girth without the mush. If you like "JB" pickups, you'll be blown away by the Anvil. Thin rails sense a narrow section of string, reducing note smearing and muddiness. There's still plenty of low end, it's just more defined and less mushy. Aggressive fast riffs, complex chords, and palm muting are tight, clear and cut through the mix. Clean or dirty, standard or low-tuned, the clarity is beyond other pickups. Oversize 6mm diameter poles sense a wide section of string, increasing thickness and sustain. Slow bend, double stops, or fast shred, the tone stays fluid and soulful without any thin, nasty harshness. The rails/poles are larger than traditional polepieces, and have a very large surface area contacting the magnet. This produces a strong and wide magnetic field which is very touch sensitive and responsive to your playing technique. It also means no dead spots when you bend, even on the pole side. The rails taper up, with the highest point under the D string. Volume of the D string is now increased, which is typically weaker. This gives you more consistent volume overall from string to string. A traditional baseplate has four screws securing the bobbins to the baseplate. We added two extra screws which reduces internal vibration, preventing uncontrollable feedback and squealing. Non-adjustable poles, along with vacuum wax potted coils and the six screw baseplate, result in a solid pickup with no moving parts. Excess vibration has been eliminated which can cause uncontrollable feedback and squealing. Another benefit is enhanced clarity and response, because when the parts don't vibrate, they more accurately sense string movement. The oversize poles and long rails cover a wide string spread, which means the spacing will work with just about any guitar in any position. Experience this tone breakthrough for yourself. Order today.